As always, use as many organic ingredients you can find for best flavor. Season shanks with salt and pepper. Heat 3 tablespoons of oil in large ovenproof pan or pot. Brown meat on all sides about 12 minutes. Remove shanks to a plate. Raise heat and add mushrooms. Salt and pepper mushrooms. Brown mushrooms and sauté until tender 6-7 minutes. Remove to plate and reserve. Reduce heat, add remaining olive oil and heat until hot. Add diced onion, carrot and leek. Sauté one minute and add minced garlic. Sauté vegetables until lightly brown, about 10 minutes. Add wine and bay leaf. Bring to a boil to cook off acidity and reduce by half. Add stock and tomatoes and bring to a boil. Season with salt and pepper. Return meat to pot, cover and place in preheated oven and braise until meat is falling off the bone about 2 hours. Periodically check meat and add more chicken stock if necessary. 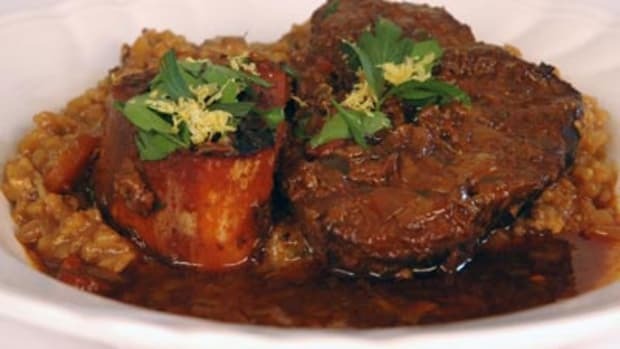 Braising time could take as long as 3-4 hours. During the last hour of braising make roasted garlic mashed potatoes. See recipe below. Cool meat to room temperature while sitting in braising liquid. Remove shanks from liquid when cool. 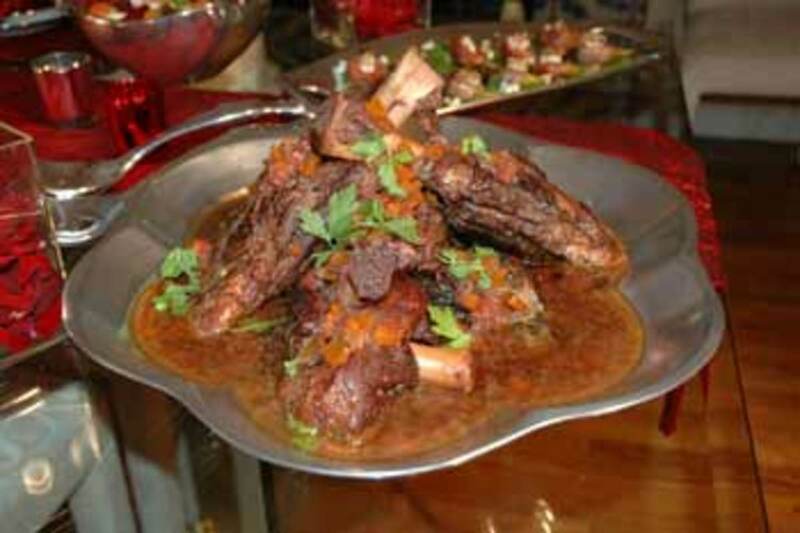 Defat braising liquid by skimming fat from the surface of liquid or refrigerate and remove. This dish can be made up to one day ahead at this point and then be reheated. Reheat braising liquid and bring to a boil. Reduce heat and simmer for 10 minutes and continuously skim sauce. Add fresh basil and marjoram. Return meat to sauce and simmer gently until heated through. Remove and keep warm. Add mushrooms and simmer until heated through. 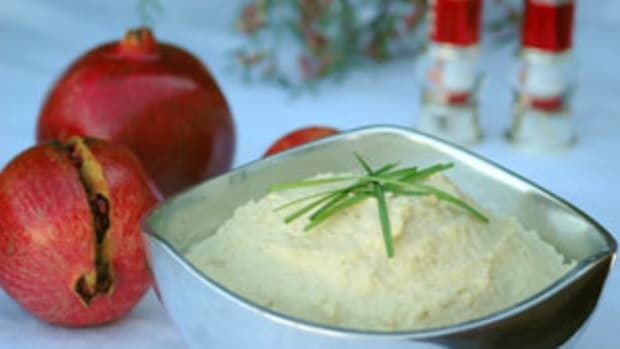 Serve in large deep platter accompanied by garlic mashed potatoes. To roast garlic, cut tops off of garlic and drizzle with one tablespoon of olive oil each and wrap each in foil. Roast until tender and soft about 45 minutes to one hour depending on the size of the garlic heads. Cool and remove garlic cloves from skin by pulling cloves from head and squeezing out softened garlic. Bring a large pot of generously salted water to a boil. Peel and quarter the potatoes and add to boiling water. Cook the potatoes until fork tender (about 20-30 minutes) and drain. 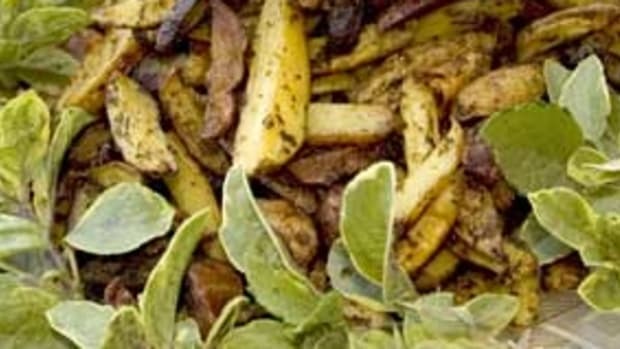 Once potatoes are drained, push potatoes through a potato ricer (see Laura Klein&apos;s must have kitchen tools for a description of a potato ricer or food mill back into pot and return to medium heat. Using a wooden spoon, stir potatoes for 1-2 minutes to evaporate remaining moisture. Stir in milk and garlic puree into the potatoes and season with salt and pepper to taste.